No this isn’t Will Ferrell’s latest comedy or a new ad from Geico. 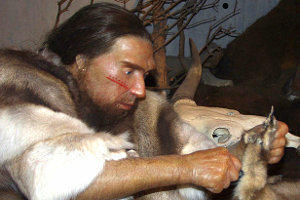 New research shows that Europeans and Asians have a bit of Neanderthal in them. In many ways this result was surprising. Not because my ancestors and Neanderthals didn’t have the opportunity to hook up. They did. Humans and Neanderthals overlapped in Europe, Asia, and the Middle East tens of thousands of years ago. What was surprising about this latest research is that most of the previous data argued against human-Neanderthal hanky panky. For example, extensive searching showed no Neanderthal DNA in our mitochondrial DNA. And almost all of the fossil evidence argued against interbreeding. A big exception was a skeleton found in Portugal. This skeleton looked so much like a mix between Neanderthal and human that some scientists thought that is exactly what it was. And they may have been right. A couple of weeks ago a German group announced that they had figured out about 60% of the DNA from three Neanderthal bones. They took this DNA and compared it to one San from Southern Africa, one Yoruba from West Africa, one Papua New Guinean, one Han Chinese, and one French person from Western Europe. They could see Neanderthal DNA in the European and Asian DNA but not in the African DNA. The European and Asian result is probably pretty solid but the African result will need lots more data to back it up. With so few Africans tested, a negative result might just mean that the scientists happened to find some Africans who by chance have no Neanderthal left in their DNA. They’ll need to check out a whole lot more African DNA to really nail down this result. What was most interesting to me about all of this is that after tens of thousands of years, scientists could still see Neanderthal DNA in human DNA. After something like 3000 generations of dilution, I would have guessed that if the DNA didn’t matter, scientists wouldn’t be able to see it anymore. So maybe the DNA that was left is important somehow. More research will need to be done to show whether this is the case or not. I’ll also be interested to see if red hair came from Neanderthals or not. Around ten years ago there was some speculation that it may have. Red hair is caused by changes in the MC1R gene. And there seem to be way too many of these changes in the MC1R gene of Europeans for them to have arisen in just the 40,000-50,000 years that humans have lived in Europe. One explanation for where all of these changes came from is our cousins the Neanderthals. Neanderthals were in Europe for a much longer time than humans were and so there was more time for MC1R mutations to accumulate. So maybe all the MC1R changes we see in Europeans came from their Neanderthal ancestors. Scientists did find that some Neanderthals had red hair. But the one change they’ve found in the Neanderthal MC1R gene is different from any yet found in humans. Figuring out more Neanderthal and human MC1R genes should help resolve this issue. Who knows, maybe the red highlights in my beard and my wife’s freckles came from our shared Neanderthal past.